The coming-of-age novel that Barry Gifford was born to write, Memories from a Sinking Ship recounts a uniquely American childhood and adolescence through a boy’s travels with his mother and occasional time spent with an ailing gangster father. 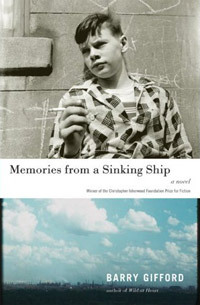 Memories from a Sinking Ship completes the spellbinding, largely autobiographical account begun previously in Wyoming and in the memoir The Phantom Father, set against the backdrop of 1950s and 1960s Chicago, the Florida Keys, and New Orleans–an America that has disappeared except in memory. In the late 1980s Barry Gifford began writing stories and books based on his childhood–not self-portraits so much as portraits of his mother, his father, and the world they inhabited, to which he’d been abandoned as a boy, like a visitor from another planet. They were A Good Man to Know, The Phantom Father, and Wyoming. Then in 2006 he completed the concluding section–nearly 20 years after he’d begun the project. Now that he had the ending, he could go back and cull the rest. The resulting novel, divided into three parts, is Memories from a Sinking Ship, a coming-of-age novel, winner, in advance of publication, of the Christopher Isherwood Foundation Prize for Fiction.